With Friday's torrential rain, flash flooding and numerous streets closed off due to flooding, my plan was to just relax this weekend and sew a dress for work. 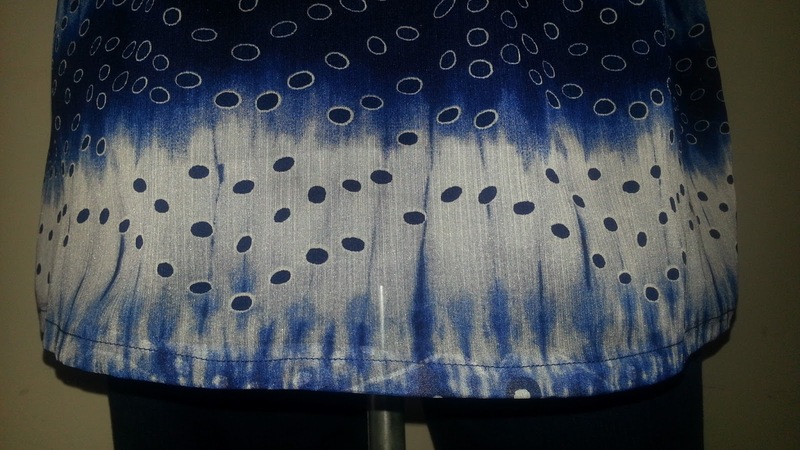 There was still residual raining on and off Saturday and proceeded with my plan to sew a dress, after partially completing the dress my thoughts drifted back to not really having weekend gear. Yes, I have jeans and numerous tops, but not something that would add some ump to my weekend wardrobe. I ventured down to my fabric room and sifted through my newly organized pattern stash and New Look 6126 whispered I am the chosen one....lol. Pattern Description: From Project Runway, Misses Kimono style cover up with drawstring or wrap & tie belt. Luckily I'd just went on a fabric binge during my birthday weekend and had the perfect fabric, which I'd washed and had piled on top of my crafting table waiting to be schlepped to the basement, but... umm never made it there. I chose Version A.
I love tank tops/camisoles, wear them constantly, perfect for pairing under a suit or wrap dresses or drape neck tops. 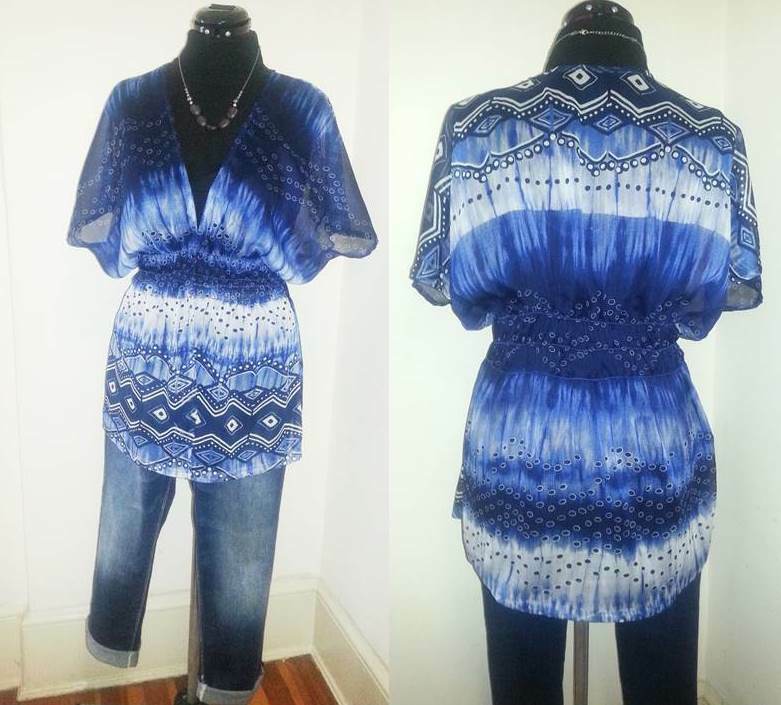 Fabric Used: Sheer border print. The pattern instructions were beyond easy and went together effortlessly... there are only 3 pieces. Actually I only used 2 pieces, opting out of the casing strip. 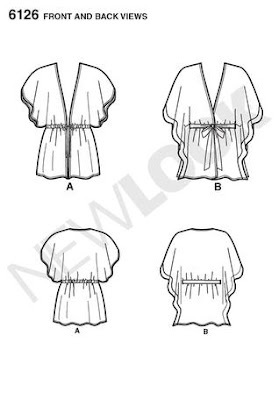 Followed the instructions by attaching the fronts and back at the shoulder seams (double serged), pressed up a narrow hem with steam-a-seam along the raw edges and neckline, as well as hemline and sleeve hem, folded again and final stitched. Continuing on, the pattern instructs to make a casing for the drawstring, but I decided that was a tragedy waiting to happen. 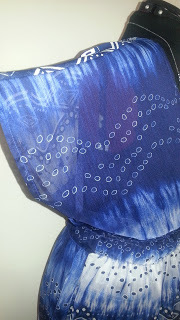 The fabric is tissue weight sheer and just couldn't wrap my mind around making the casing. 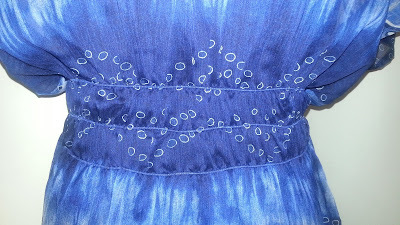 I pulled out 1/4" clear elastic instead with the plan that I wanted several rows of stitching. I didn't have any problems with the fabric shifting during cutting, but trying to sew the elastic along the marked lines was a super slippery slope. Since the drawstring was not an option, I used sew -on snaps for closures. I although I love tank tops, I am not comfortable wearing them without covering my shoulders. This kimono is perfect as a light cover up. What a great piece of fabric that you used for that very cute top! Your new top is really cute, definitely perfect over camisoles. Love the fabric. This is a perfect summer cover up. Love the color. I love this on you. This style would be a great bikini cover up on the beach, too. Oh and your shoes are gorgeous! this turned out great, I would have never looked at this pattern twice but you made it look amazing, love the fabric! The top is so pretty. I would have never thought to use a robe pattern. What a score. Love this top. You certainly have lots of wildlife to watch out for. Thanks Mrs. Smith. Enjoyed wearing it and the perfect topper. Happy Belated Birthday! Birthday fabric binge - I love it! You look marvelous! This top is too cute! Love the style and the fabric is to live for! Nice work!! Thanks Andrea. It is super perfect over camis. Beautiful fabric and a great marriage with the pj pattern. I would have never thought of this. The whole outfit is fabulous. Happy Belated Birthday to You! Turning 50 is the beginning of great things. Your posts just crack me up. lol. Thanks for the Awesome compliments. It looks really comfortable. It has a batik look to it. Your comments about the dog and birds are hilarious. I guess they wanted to get in on the action. Alright now Sheila! Love your "not your standard pajama robe". It's cute, different, and I love the color. As a matter of fact, your robe fits perfectly with my Summer Breezes collection. Why don't you send it to me??? I love the fabric for this top and what a brilliant use for it. Looks casual but nicely put together. Happy belated birthday....50 REALLY? I would have guessed you to be in your thirties. And yes, I am serious about that...you are aging very nicely. Lucky you! Thanks For the Lovely compliments and Birthday Wishes. Totally NOT pajamas! I love the color, Sheila! Wow, so cute! I love this top and the fabric is perfect for it. You look great as always! What a cute, cute top! I love that fabric soooo much! Great job putting this one together! Thanks Ladies and on to my second one... in kimono love. So stunning, Sheila! I also adore those fun photos. Amazing, the fabric is so pretty. Job did a great job on the pajama top. I will buying the pattern this week. You are too funnyyyy! LOVE this, and also love your photo comments! I LOVE this top on you! I would love it on me! I think I need to buy that pattern STAT. Really great mix of print and pattern, Sheila.